I doubt there is a need for this to be a plasmoid, as it will just clutter Plasma with yet another weather applet. But hey, if people like it, I (or someone else, preferably) can make it. Is it possible to integrate qtwebkit and krunner results? @Javi: integration is technically possible, but if the result is non-visual, better to use the exisiting weather data engine. 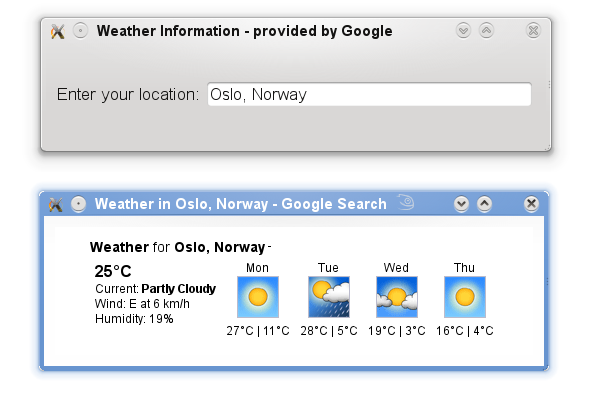 Is it possible to add this to the 3 other weather services, integratet in plasma? It would be great to find this integrated into the weather data engine. It's probably not possible to integrate this into the weather krunner as it would probably violate the google terms of service. That said, making a plasmoid out of it would be trivial. I rather have something like this as a regular app with a managed window than a YAPA (yet another plasma app) - for me things that I want to look at eventually have no place whatsoever inside the desktop shell - they are obscured by the things that I need to work with anyway and closing all my windows just to get to the extra unmanagable layer of windows that plasma has introduced simply is a nono, so please refrain from messing up this nice little application! What license is the google data? We can turn this into a engine.